I love this shower gel. It’s a nice thick consistency. It has great throw so you can smell the lovely scent all while you’re showering with it. It’s lovely scent stays on the skin a bit longer than other lush shower gels. It’s not particularly moisturizing, and doesn’t have any cocoa butter. Nor does this shower gel have any glitter. 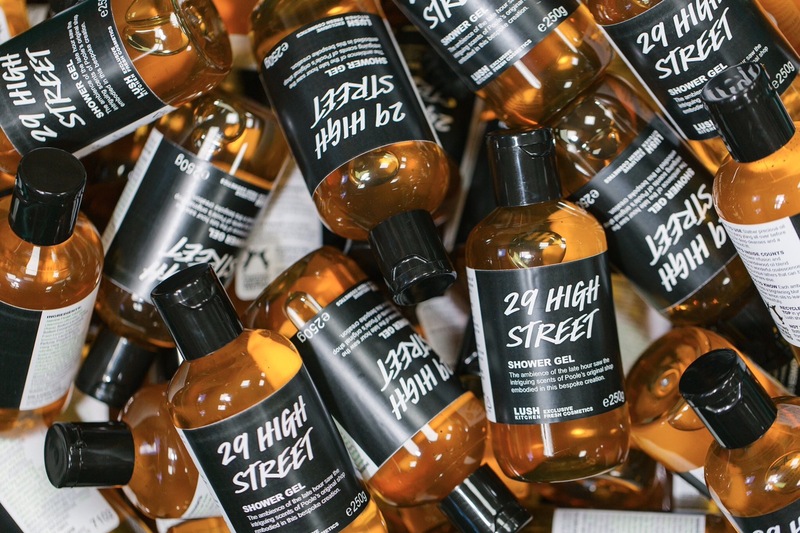 The 29 High Street was made to have the scent of a Lush store. So various lush store favorites are represented here, honey i washed the kids, karma, avobath, etc. Because of these things, and also because this shower gel is so rare, I would rate this shower gel a 5 out of 5 rating. I would highly recommend it. I bought six bottles. here is a scent family portrait I created, with all the products Lush has made with this same fragrance. Posted on August 8, 2016 by Lushalot	• This entry was posted in Lush Kitchen menus and product demos, Shower Gels and tagged black pearl scent family, jasmine, lush 29 high street shower gel, lush 29 high street shower gel review, lush kitchen, lush kitchen 29 high street shower gel review, orange, sandalwood, tonka. Bookmark the permalink.